Stand up collar – Nice dress! Thanks, I made it!! The weather today was so changeable, I sat here this morning trying to decide if I should put the laundry on the clothes line… or take photos for my blog. What should I do? You might remember last post I was fighting to make my dress pattern work with my fabric and my body. That pattern lost. 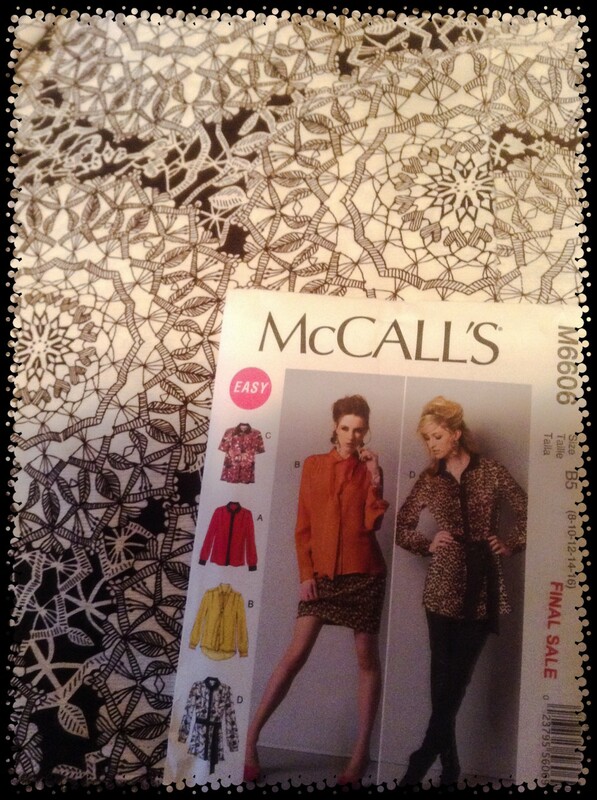 This pattern, on the other hand, McCall’s M6840 was a winner. I made view B but with short sleeves. Short sleeves since the fabric is so summery – but also after salvaging the fabric out of the almost completed dress, I didn’t have enough pieces left that were large enough to make long sleeves! … my UnFinished Object is only from April! I found it and two others when I was cleaning up my pattern and fabric stash! I’m surprised I never finished this shirt right away as I love this fabric! Then again, I am glad I didn’t finish it right away as by the time I did get around to sewing it up, I had some black remnants that I could use for the contrasting collar. My pattern was McCall’s M6606, view C with the hem line of view B. I’ve never had a shirt with a short hem line in the front and a long one in the back. A novel idea for me! My fabric was a 100% polyester called “Chiffon”.